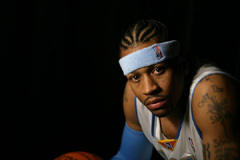 Allen Iverson Live is the source for the latest news AI and the Detroit Pistons. Stay tuned as we'll be launching a new version of the site soon! Allen Iverson was traded from Denver to the Detroit Pistons on Monday in a major NBA shakeup that could but both clubs in better position for a championship title. The 33-year-old guard, in the final year of his $21.9 million contract, went to the Pistons while Detroit guard Chauncey Billups, forward Antonio McDyess and Senegalese center Cheikh Samb were sent to the Nuggets. As the 2007-2008 NBA campaign is almost here Allen Iverson even though now living in Colorado should be starting to feel the heat. Last year preseason everyone new Allen Iverson or no Allen Iverson the Philadelphia 76ers were either about an 8 seed or less even in the lowly Eastern Conference. Then it happened Allen Iverson’s demand was answered and the Denver Nuggets came calling. With half a year including playoff experience the expectations should be higher than it seems they are, and this team is only built to win now. When Allen Iverson helped two college students in a car wreck in Virginia in August, few noticed his good Samaritan deed. Now, roughly six weeks later, in the wake of a pending lawsuit against him, people are noticing Iverson and the bad publicity that seems to follow him. That's just part of being A.I. "I could do a million things positive and everybody would talk about the one negative thing," Iverson said. "I'm used to it and it don't bother me that people don't recognize, as far as you people and other people that don't matter. The only people that do matter is the people that I do it for, the charities, the people that benefit from it." The Nuggets' post-season run came to an end, as the Spurs beat the Nuggets 93-78 in 5 games. It was one of Iverson's worst playoff performances, where he made just 31 of 92 shots, after scoring 31 in the their Game 1 win. "I felt like this was the worst playoff series that I've played in my career," Iverson said. "It was kind of frustrating, coming into a new situation, wanting to be the one that gets this team over the hump, get them out of the first round. And to play like I'm not capable of playing is just frustrating." But the outlook looks good for the Nuggets, we saw a glimpse of the Nuggets full-force near the end of the season where they won 10 of 11. Once they get a full training camp together, they could possibly be a top 1-2-3 seed in the West. Hopefully, they'll be able to keep Camby in the off-season, and have a healthy K-Mart come back in October. The Denver Nuggets coach returned to the team after spending two days with his son, who had surgery to remove cancerous lymph nodes. "We were all aware of the situation, with his son and everything" Nugget forward Carmelo Anthony said after Denver's 120-115 win over Sacramento on Wednesday night.. "He settled us down by telling us all was well." The Denver Nuggets have found their stride lately, with 5 straight wins against Sacramento, Portland, LA Lakers, New Jersey and a huge win over Phoenix, where they totaled 131 points against the league's highest scoring teams. AI scored 44 points and dropped 15 assists, and Melo had 29 pts. They showed how dangerous the Nuggets can be when their offence is at full-force. We all know by now, that AI will be missing in action this Sunday's All-Star game. However, his fellow superstar, Carmelo Anthony will be playing in his first All-Star game. They've actually only played 6 games together since Iverson came over from Philly. We still haven't seen the Nuggets at their full force, due to injuries and suspensions...Hopefully, the All-Star break will allow them to fully recharge and surge during the second half of the season. Allen Iverson appears to have his priorities in order. The superstar guard of the Denver Nuggets said Tuesday he will use the All-Star break to rest his sprained right ankle, becoming the fourth member of the Western Conference team sidelined by injury. "I'm very disappointed that I can't play right now," Iverson said. "I was really looking forward to representing the Nuggets in my first All-Star Game with the West. However, I need to make sure my ankle is 100 percent for the stretch run." Allen Iverson is closing on Tracy McGrady for the second guard spot in the Western Conference All-Star lineup. McGrady had 1,331,511 votes in the totals released by the NBA on Thursday, just 31,263 ahead of Iverson in a battle of perennial starters. AI has played pretty well his first 5 games with Denver, averaging 28.6 ppg, and 8.8 assists...although they're only 2-3, he's playing well on a depleted team, things should be much better once they get the full roster back. Also wanted to mention, don't forget to vote for AI in the All-Star game! He'll be up against Kobe Bryant and Steve Nash...so it's gonna be tough. If you wanna see AI on the starting line-up. Vote now, and keep voting! Site News : Happy New Year! Just wanted to say a big Happy New Year to all our visitors! Welcome to 2007! Can't believe this site has been running for 5 years now! 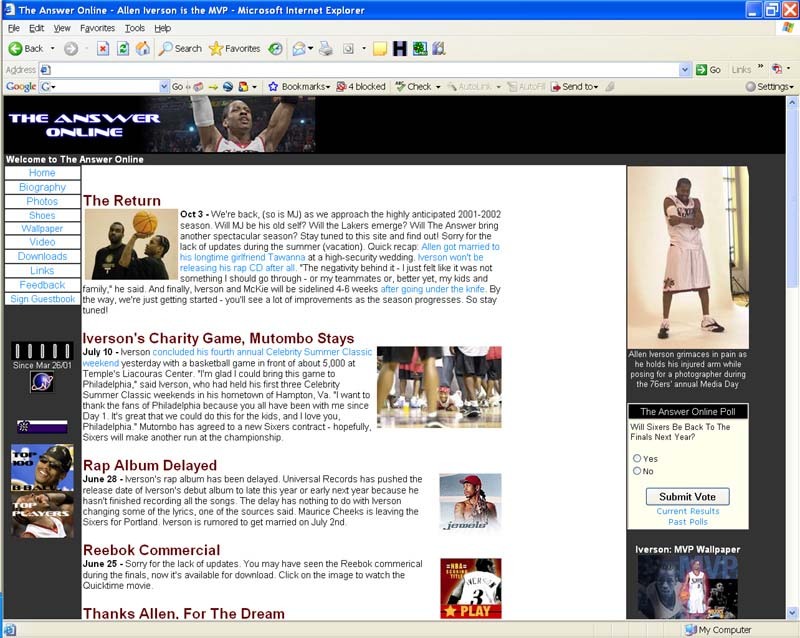 Thinking back, it started off as a small little site on Geocities back in 2001, and has now grown to be the biggest fan site on Allen Iverson on the internet. Just wanted to thank everybody for visiting over the years... and keep coming back cuz 2007 is gonna be awesome...new team, new coach, new teammates...but still one goal for AI -- a championship! Nuggets : Mile 'Hi' To A.I. AI made his highly anticipated debut as a Denver Nugget, all decked out in Baby Blue, White and Yellow (still need to get used to the colours), and played a good game despite a loss to Sacramento. He fought through jet lag, car sickness and pregame butterflies that felt more like birds before he finally got to play his first game for the Denver Nuggets. He posted 22 points, and 10 assists -- not bad considering he hasn't been playing ANY ball in game or practice for a week. He would've had 20 assists had his teammates made their shots. Overall, AI's debut brought a new level of excitment to Denver...even though they did lose, the fans got to see how exciting it was to watch A.I. play hard, hustle, pass the ball and doing everything he can to win the ball game. Can't wait until the next game. Looks like Larry Brown, who took the Sixers to the finals in 2001, might be going back to Philly after the departure of Allen Iverson. Allen Iverson in yellow and baby blue will take some getting used to. It's finally happened! After a decade with the Philadelphia 76ers -- from being Rookie of the Year to being the league's MVP - Allen Iverson has left the Sixers for good. It's been a funny series of events. Think about it: Iverson gets benched by the Coach and GM, and then Iverson demands a trade. They couldn't find the right team until Denver Nuggets and New York Knicks get into an ugly brawl in which All-Star Carmelo Anthony is suspended 15 games...which then leads to Nuggets desperately seeking a superstar like Allen Iverson. An amazing turn of events. Personally, I'm excited. Finally a change of scenery for Allen Iverson and another shot at the playoffs with a fellow playoff team. The two highest scorers in the L playing side-by-side. That's gotta be exciting to watch! I know all of you Philly loyalists are going to hate this one...but face it - What's done is DONE -- move on, if you're an A.I. 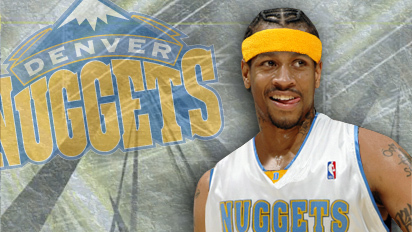 fan then I'm sure you'll continue to follow him as a Denver Nugget -- just like this site will continue to cover A.I. Allen Iverson was nearly shipped to the Charlotte Bobcats but his unhappiness at joining the newest National Basketball Association team reportedly doomed the deal. Charlotte was one of the few clubs that could fit Iverson's contract into their salary cap. The Hornets spend 38 million dollars in salaries, about 15 million dollars shy of the NBA's cap of 53.1 million dollars a team. Players who likely would have joined the 76ers would have contracts that expire within 18 months, meeting Philadelphia's needs.